Kendall Jenner is back doing what she does best: flaunting her endless legs! This time, she strutted her stuff in a pair of Isabel Marant shoes. The 20-year-old model paraded her mile-long stems while furniture shopping at Restoration Hardware Modern in Los Angeles on Wednesday — just a day after enjoying a family ski trip in Colorado. Opting for laid-back cool, the “Keeping Up with the Kardashians” star wore a pair of RTA distressed denim shorts with a white ripped neck tee by LNA (available at Shopbop). She tied the grungy t-shirt in a small knot just above the navel to show a hint of her flat abs. To amp up the casual ensemble, Kendall sported a long cream coat and accessorized with a pair of Anhelm round sunglasses (available at Azalea), a black M2Malletier backpack (available at Forzieri) and a pair of Isabel Marant sneakers. 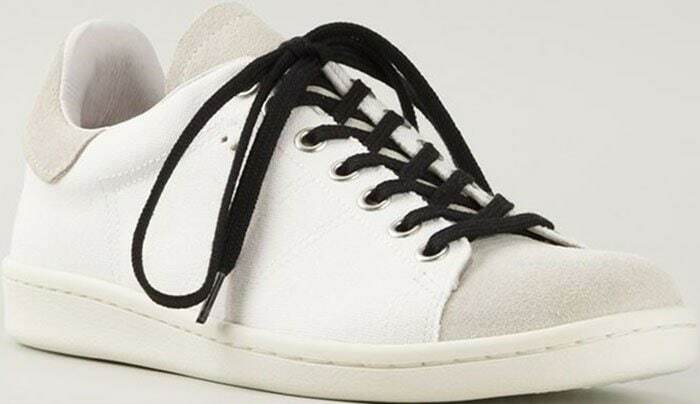 These retro-inspired Isabel Marant “Bart” sneakers are crafted from soft-toned canvas and suede materials. You can check them out in different colorways at La Garconne.